Asheville, North Carolina is a great place to live and visit no matter what time of year it is. Asheville is nestled in the Blue Ridge Mountains in Buncombe County and is known for its mild climate year round. The average elevation of Asheville is 2,165 feet. The average yearly temperature in Asheville is 55.4º. Asheville has such pleasant temperatures year round, it is no wonder this area is widely known for its natural beauty and mild climate. In the summer months the temperatures are perfect to enjoy the lakes and rivers that surround Asheville. From water skiing and wakeboarding to swimming and tubing, the average temperature of 72.8º in the month of July is perfect for fun water activities in Asheville. Springtime in Asheville is perfect for golfing and fishing, with mild temperatures and cool evenings. Fall may be the most beautiful season, with the vibrant colors of the leaves turning, cool mornings and nights, and the smell of wood burning fireplaces to knock off the chill. During the winter, the average temperatures are around 35.7º and average snowfall reaches about 14.9′ a year. The snowfall allows the area’s ski mountains to open around November, and skiing and snowboarding are a favorite pastime for both residents and visitors. Asheville is the perfect small mountain town, offering all the arts and culture of a big city. With its mild climate and stunning beauty, many residents and visitors choose to participate in outdoor activities to allow the true beauty of the mountains to be seen and enjoyed. 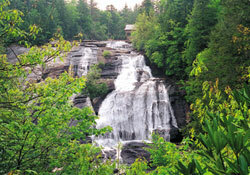 Asheville weather is just one of the aspects of this area that make it such a popular vacation and new home location.